A long time ago I was contacted by the Pixar Animation Studios. They said that they were doing a short animation about one man bands and wanted to buy my DVD. I sold them a DVD for $10 and didn’t think about it again for a long time. Then a few years ago a little girl told me that she had seen me in a cartoon. I thought she must be talking about “Totó Sapore” which is an Italian cartoon that features a one man band, but her mother lent me the DVD of the Pixar/Disney movie “Cars”. 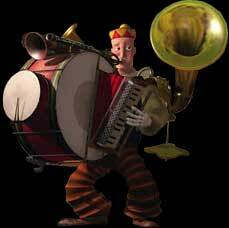 The short called “One Man Band” blew me away! I really thought that it was great that they had made such a cool movie about one man bands. I did see a few little things that reminded me of myself but explained to the girl who had given me the DVD that it was just a cartoon character and not really me. A few days later my wife said, “Didn’t Pixar contact you for a DVD because they were making a movie about one man bands?” Then I remembered! I’m not saying that that is me in the film or that they stole anything from me, but the film is inspired by my DVD. I wish I had asked for more than $10!